Estimating the size, effort, complexity and cost of software projects is possibly the most difficult task in all of Software Development and Project Management. Even estimating the time required to complete seemingly small and straightforward tasks can be annoyingly, or even dangerously difficult to do. Software Project Success is determined in large part by the ability of the team to meet stakeholder expectations. To be predictive, you need data and most prediction models typically use historical data as the basis of their forecasts. Stock market analysis and weather forecasting are classic examples. In spite of mountains of historical data, advanced algorithms and supercomputers to perform the calculations, weather forecasters are accurate less than 50% of the time. There is even more historical data, incredibly sophisticated algorithms and and nearly the same computing power available to market analysts. In the markets, success is somewhat better for some than others, and fortunately, to be successful in the stock market, you need only be right more often than you are wrong. Some win very big, but most, however, struggle to hit that 50% mark. In 1979 Kahneman and Tversky found that human judgment is generally optimistic due to overconfidence and insufficient consideration of distributional information about outcomes. Further, risks typically are underestimated and benefits overestimated. This is a human bias resulting from our “inside view” of the project. There is a human tendency for us to want to please others and in so doing we bias our estimates optimistically in the name of pleasing our stakeholders. Changing the estimate does not, however, change the amount of work that needs to be done, and in the longer term, shortcuts rarely turn out to be shortcuts. Ultimately we disappoint the stakeholders by delivering late. External forces (budget, customer deadlines, completion, etc…) pressure us to complete things as quickly as possible. Again, this is an external pressure that creates internal tensions which the team tries to satisfy. It usually distorts the estimates, but rarely changes the reality. Things change – the project requirements shift, the client needs more features to be added or removed. Technical uncertainty causes us to sometimes take a wrong path and have to redo work. The tools and technologies are constantly changing, causing developers to continually learn and adapt to the latest releases. In each new release of tools that they use from vendors, they will encounter bugs that are fixed, potentially causing old workarounds to break, while at the same time introducing new bugs. In many, if not most cases, there is no baseline. How can you estimate how long it will take you to do something that you’ve never done before? This leads to the question: If you’ve done it before, why are you doing it again? The tasks are often too many, too large and too complex, and with too many interdependencies to fully understand their implications. Software is part science, but a large part of it is art. Because a lot of it is art, creativity and productivity of individual team members will vary dramatically and the quality and quantity of their input will vary correspondingly. Somewhat counter intuitively, the productivity is not related to levels of education or years of experience. Given two individuals with essentially identical education and work experience, researchers have measured differences in productivity of as much as 100 times. These are the intangibles of insight, creativity and commitment, and they are far more important than education or certification, but nearly impossible to measure. One of the most significant influences affecting accuracy of estimates is illustrated in the following example. Focused attention distorts perceptions of time. I remember years ago reading about a study that was performed on highly trained fighter pilots to determine how their ability to estimate the passing of time was affected by their degree of mental focus applied to the tasks they were performing. As I recall, the test was set up so that the pilots were placed in flight simulators and the people running the test started a stopwatch and requested that the pilot indicate when ten minutes had passed. There were several scenarios of varying complexity that required pilot engagement ranging from routine in-flight functions like communication with the control tower to full air combat simulation. As the complexity of the tasks and corresponding need for focused attention increased, their perception of time became increasingly and dramatically distorted. In the simple task tests, the pilots routinely estimated the duration within a few seconds accuracy. At the extreme end (full air combat simulation) the estimates were dramatically off – sometimes in excess of 300%. In other words, when the greatest attention and focus was required, highly trained pilots let as much as 30 minutes pass, while believing that only ten minutes had elapsed. Productive programming requires similar levels of focused concentration. Thus as a programmer’s focus and corresponding productivity increase, their ability to determine how long it takes to do something declines. For anyone who has done extensive software development this effect is clearly evident, yet very difficult to compensate for in estimates as it is unique to each individual. My wife has for years witnessed me disappear into “The Zone” and has come to refer to this effect as “Programmer Time” vs. “Real Time”. The irony in this situation is that we want developers to spend as much time as possible in The Zone where their productivity is maximized, but while in The Zone, their estimates of time are dramatically distorted. We then somehow expect them to use this hugely distorted perception of time as the basis for their estimates. Ranking effort on a scale of one to three – one being the smallest, and three being the largest. Using a Fibonacci Sequence [1, 2, 3, 5, 8]. A Story ranked as an eight is a Story that is too large to accurately estimate and should likely be classified as an Epic and decomposed into a smaller set of Stories. There are other methods, but these are the two most common ones that I have encountered. Of note in both cases, the estimates are not produced in terms of units of time. Rather they are merely expressions of Relative Effort. There are several good reasons for this approach, but principally it is recognition of the variations of team dynamics, experience and productivity. For example: Using the Fibonacci Sequence scale, a task ranked as a five for a highly efficient and very experienced developer might take one day to complete whereas it might take a junior developer five days to complete. Alternatively, the same time differences may exist between two senior developers with very similar experience. This may have nothing to do with the overall aptitude of the individuals, but may be due to a personal problem solving style that is more effective in that specific instance. Or one developer may have solved a similar problem in the past that caused the solution of this particular problem to be obvious. Relative Effort is thus a good comparative yardstick. Story size is an estimate of the relative scale of the work in terms of actual development effort. A very small story representing tiny effort level. Think in terms of only a few hours of work. The wording provided here is a suggestion. Develop wording that works best for your team. Remember that these are guidelines – not rules. This is complexity of either or both the requirements of the Story and or its technical complexity. Complexity introduces uncertainty to the estimate – more complexity means more uncertainty. The wording provided here is a suggestion. Develop wording that works best for your team. Not all factors listed need to be met – remember, these are guidelines, not rules. 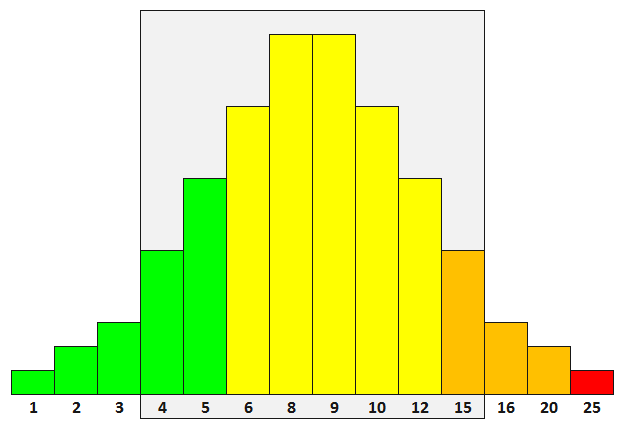 Distribution: This is a measure of how well the distribution of your estimates map to a bell curve. Velocity: A measure of how many units of Effort are completed per sprint as compared to how many units of Effort were forecast. Velocity is a large topic on its own and will not be discussed in this article. The process of calculating and comparing Velocity to forecasts is part of a larger Calibration process. Calibration is the feedback loop used in the setting of baseline metrics that are at the core of making all of your processes and estimates more predictable. We will use external mechanisms (to be discussed in a future article) to calibrate the Intrinsic measure of Relative Effort (as determined by the team) and use an Extrinsic view to measure Velocity (Relative Effort Compared to Time) and turn it into Time Estimates. This will help us offset The Zone effect in our time estimates and improve the accuracy. Look for a discussion on this in the next few weeks. If you are estimating well, and your Stories are scoped appropriately, then there should be a distribution of Effort approximating the distribution of the classic Bell Curve. While one could go into tremendous detail calculating Standard Deviation and performing other analysis, what we are looking for here is a simple litmus test to act as a reality check on our estimates. This is a quick and easy exercise with a spreadsheet to gather the raw data and chart it. Your distribution should look something like this. What we are looking for is a clustering of estimates in the range of [4..15]. Ideally, you do not want to have anything in the [1,2,20,25] ranges. Appropriate scoping of stories: If your stories are written so that your distribution is weighted in the [10..20] range, your Stories are likely too large, and or too complex. If the distribution is weighted in the [2..9] range, then they are likely too small or not sufficiently complex. In either case, work through the Stories in successive iterations (Sprints) to re-scope and refine them. The sweet spot is to try and have your stories scoped so that the vast majority of your Stories scale in the [4..15] range. Accuracy of your estimates: This article defines the structure for managing Estimates. An upcoming article will describe the actual real-world mechanism for determining individual estimates. Look for it in the weeks to come. Every team and every organization will be unique and everything in this article should be considered a guideline and suggestive rather than prescriptive. As the person leading your team, you will have to work with the team to find the balance point that works best for accurate calibration of your team. In both examples listed above, use an iterative process to discover and refine the mechanisms that work best for your organization. The hardest thing to accept – a lot easier to understand – is that complexity, size and ideal days spent are independent from each other outside a box. It will be interesting to see/read what experience you had with velocity. In general I would agree. Most of the stories are form 9 to 12, they are less risky. Anything that goes beyond or some of those who are considered simple should be rethought if they are really understood or just written down in 2 sentences – because everyone knows. “It is just …” If it really just then it is an evolution of an existing story. Anything dark yellow red can requrie (“seperate project”) a more structured approach to satisfy the requirement e.g. more formal design in order to figure out the right questions. Assuming a month interation I think this methodolgy can proof in practice for ideal days of a team with a very satisfying velocity. I used to use one month sprints. I now tend to use two week sprints. I think in part the one month sprints was because in moving to Agile, I found it hard to give up the “Big Release” mentality. Two week sprints may not be the ideal in every situation, but I seem to get better results because mid-course corrections occur sooner. The next topic(s) will be about calibration and velocity. I’ve not yet decided if this will be in a single post or split into two separate posts. Whichever it is will be post Wednesday or Thursday. Nice idea, I would like to see it tried in practice. Personally I don’t think it will work as people will think complexity when you ask them to think about size. I have myself tried similar things, but never really gotten them to work. This mulitplication think is commonly found in traditional risk analysis as you know. So .. interesting idea … doubting whether it will work in practice. But perhaps? Thank you for your thoughtful comments. The key to getting something like this to work is more related to the social dynamics of the situation than anything else. If the team feels that the information will be used to control them or to be used as a metric to monitor them (both very dehumanizing things) they will resist. If, however, they can see that it will benefit them by making their job easier, more predictable, or they are more likely to receive recognition for a job well done, they are far more likely to embrace a system like this. Very interesting and concise. I’ve never thought of using a histogram for identifying how small are the tasks. Nice idea. I find your posts so well written that you should start a book 🙂 These simple tools are the one managers really need (besides soft skills, of course). Keep it up. See you. Thank you very much for the compliments. I’ve never really thought of myself as a writer, but it is indeed very gratifying to know that people find this blog to be useful. I realized this evening that I left out a section of the article. 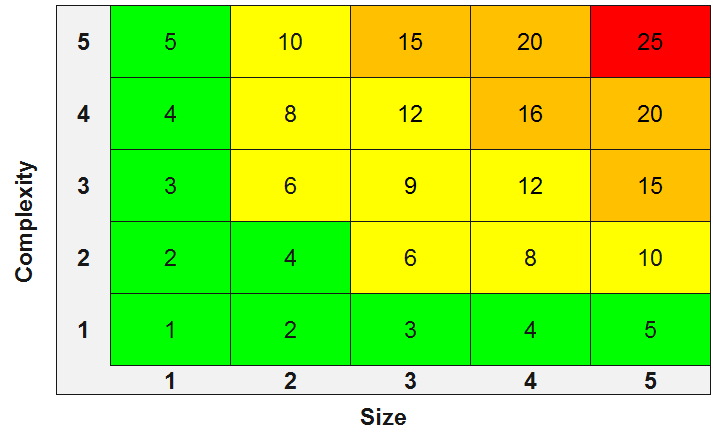 I forgot to include a section and corresponding chart that explains the four colour ranges. I will add it in the next day or two.